asking if we were interested in contributing to a wonderful eBook they were collaborating on. Of course I said yes. And so today, I introduce you to this wonderful eBook. "Mind Body Love is an eBook for mothers, by mothers. 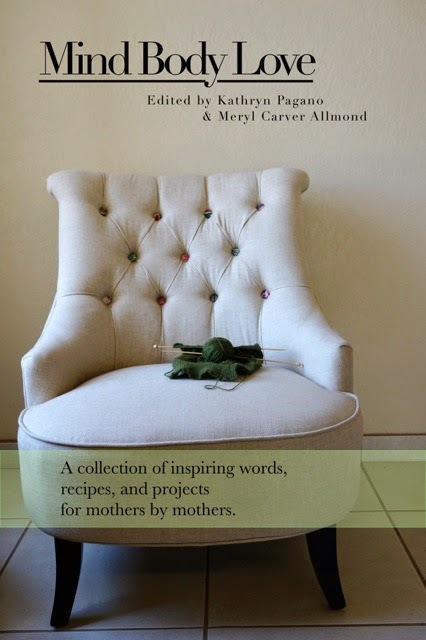 This book was created to inspire you, the mama, to take care of yourself. Not your kids, not your family, YOU. It is filled with recipes, crafty projects, exercise advice and lots of inspirational words to lift you up when days are tough. It is a collaborative effort of a dozen mindful, mama bloggers who inspire us daily with their craftiness, yummy recipes, words of wisdom and wit. This book was the born one day in the middle of winter when I happened to be reading Meryl’s blog. That particular post inspired me, up lifted me, and suddenly the idea for the book popped into my head. A book that would inspire mothers to take time for themselves. I then contacted Meryl to see if she would join forces with me in creating an inspiring resource for mothers." The book is available to purchase here. All of the proceeds for this book will go to the charity, Rescue Gifts, an organization that donates supplies to laboring mothers in third world countries. So, hop on over and get yourself a copy. It is the perfect little gift to give yourself for Mother's Day. Kim? Can I share your post on my blog? I would love for more people to know about this lovely book. Fantastic! Have a great read... Enjoy your sit by the fire... our fire pit has not been taken out of storage yet. I'm thinking maybe for Mother's day! Such a great idea Kim. Do you mind if I mention it in my post tomorrow? Thanks Tracey, that would be wonderful! Congrats! I definitely will be purchasing this book to support all of you and to support such an amazing cause! what a lovely project! congrats, and love where the proceeds are going. What a wonderful idea. Congrats on being a writer. wow! congratulations! I am going to hop on over and buy one. thanks. Thanks Lisa. I enjoyed yours too :) We are all well, thanks. Hope you guys are too. i took this book away with me on holiday last week and I REALLY enjoyed it. So now i'm back today to buy a copy for a friend who i think will love it too. That is so wonderful to hear, glad you enjoyed it. And thank you for the support, greatly appreciated.